The East Lothian town of North Berwick has been a fashionable holidays spot for nigh on two centuries with two glorious beaches and public golf courses as well as a climate that excels that of Edinburgh (which is a mere 25 miles northwards) it is hardly a surprise that it continues to be so. In 2008, a small group of local business folk decided to launch a festival to provide a selection of shows from the Edinburgh Fringe Festival as well as music acts. It had 12 shows running over four days. Eleven years on the Fringe by the Sea 2018 festival now has 10 days of music, comedy, books and children’s shows, and is now considered a highlight of the calendar of residents of East Lothian, as well as attracting visitors from around the UK. Now under new management but remaining faithful to its “small is beautiful” ethos, this year’s Fringe by the Sea sees performances from Mica Paris, Badly Drawn Boy, Shooglenifty and Withered Hand and the return of festival favourites such as Geno Washington and The Ram Jam Band, The Hot Seats, Aly Bain and Phil Cunningham and The Manfreds. The Soundhouse Organisation, which promotes live music in Scotland has curated a string of gigs from some of Scotland’s top musicians. The opening night sees a performance from the Sugarhill Gang and the Furious Five, who have joined forces to make a hip hop supergroup. On the second weekend, world The Specials Terry Hall is headlining with a DJ set. There will be two afternoon concerts especially designed for families. On the first Saturday, Major Minor Music Club present Broken Records – in a gig you can take your kids to. On the second Saturday Scottish ska band Bombskare will also be performing a special family friendly gig. The Major Minor Music Club will be presenting Edinburgh band Broken Records on Saturday August 4 and Bombskare will be reprising their FBTS experience the following weekend. Authors for both adults and children are coming to the seaside. Misha Glenny (McMafia) will be joined in a line up that also brings Judy Murray (mother to tennis champions Andrew and Jamie Murray and a Strictly Come Dancing contestant), former Bishop of Edinburgh Richard Holloway, intrepid traveller Adam Weymouth, best-selling children’s author Debi Gliori and broadcaster Sally Magnusson. Former leader of the Liberal Party, Lord David Steel, hosts three lunchtime conversation events bringing Scottish Conservative leader Ruth Davidson, former Chancellor Roy Hattersley and Radio 4 Today host James Naughtie to the seaside. All three guests will discuss current events as well as their own personal stories. Each event will finish with questions being invited from the audience. Fringe by the Sea has always prided itself on being a festival for all the family and every generation. So toddlers will be queuing up for Monski Mouse’s Baby Disco Dance Hall, which the Evening News described as “surely the best baby dance party in town”. Those too old for the baby disco will enjoy Scottish comedian Phil Kay’s madcap show, Gimme Your Left Shoe – an hour of daft humour and lots of audience participation. This festival is proof that from little acorns large oaks grow. It is no longer in the shadow of the Edinburgh Fringe, with an impressive stand alone programme that is both thoughtful and, at times, surprising. Just don’t forget to bring your bucket and spade. Tickets can be bought in advance online or at a festival booth (a month in advance), or at the event. However, organisers advice that you buy tickets online in advance as events often sell out. Click here to buy tickets. The full line-up for the festival can be found here. 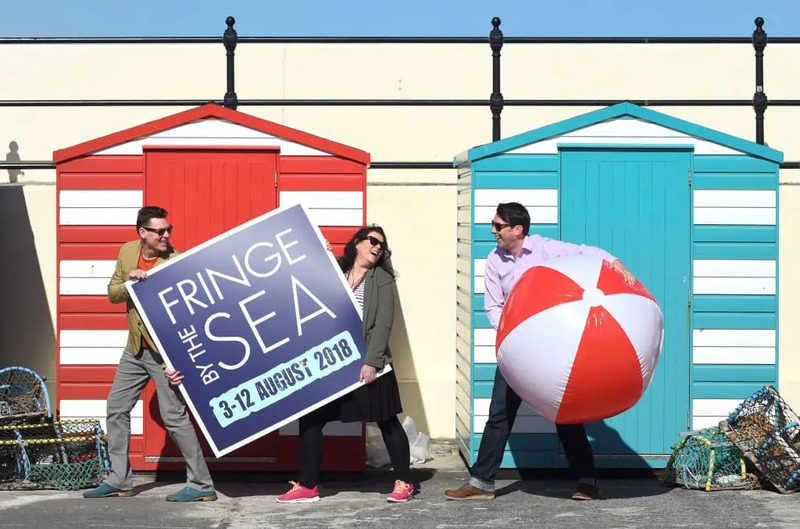 The Fringe by the Sea 2018 Festival is from August 3 – 12.